The hugely popular, award-winning game makes its comic debut! Our jump-inclined hero Doodler has landed in a mysterious wintry world and an inhospitable one, at that! With the help of an enthusiastic new friend, can he dodge killer penguins and weather the storm? Find out in this charming first issue, written by Meredith Gran (Adventure Time: Marceline and the Scream Queens) with fantastic art by Steve Uy (Avengers Initiative, JSA Classified). 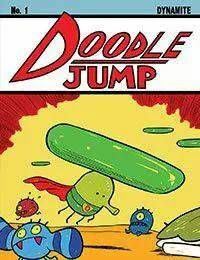 Doodle Jump, first released in 2009, is one of mobile gamings most successful titles, and has earned continual praise for its excellence in innovation, performance and user experience. Its addictive yet accessible gameply has made it a must-have classic and the #3 All-Time Top Paid iPhone app. Described by some as Pac Man meets Ugly Dolls, Doodle Jump is everywhere...from prime time sitcoms (BIG BANG THEORY) to Late Night TV (JIMMY FALLON) to a fashion accessory for pop stars (LADY GAGA).